What sort of contraception, if any, should I use? When does human life begin-at fertilisation or at some point after that? What are the arguments for and against abortion? Is it OK to use genetic screening and other pre-natal tests to check for abnormalities in my unborn baby? Should Christians use IVF and other assisted reproductive technologies? What is the current state of embryonic stem cell research? - We don't have accurate up-to-date information about the medical and technological issues involved. - We have not thought through a sound, biblical framework for making ethical decisions in this area. 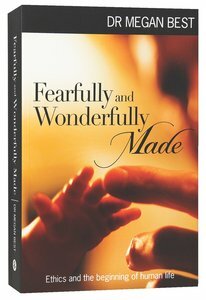 About "Fearfully and Wonderfully Made: Ethics and the Beginning of Human Life"
Customer Reviews For "Fearfully and Wonderfully Made: Ethics and the Beginning of Human Life"
This book is a must for any Christian trying to find solid answers to hard questions about Chrisian ethics, especially relating to the early stages of human life. Put it on your shelf now and read it so that you know how to think and where to reference that difficult question when you most need it. A medical doctor, bioethicist and parent surveys the science and ethics of the beginning of human life. Combining her expertise in biology, theology, philosophy and pastoral care, Best has produced an exhaustive and authoritative text. She helps readers to navigate the ethical issues raised by infertility, abortion and reproductive technologies. Fearfully and Wonderfully Made is neither smug nor judgemental but compassionate and remarkably readable.